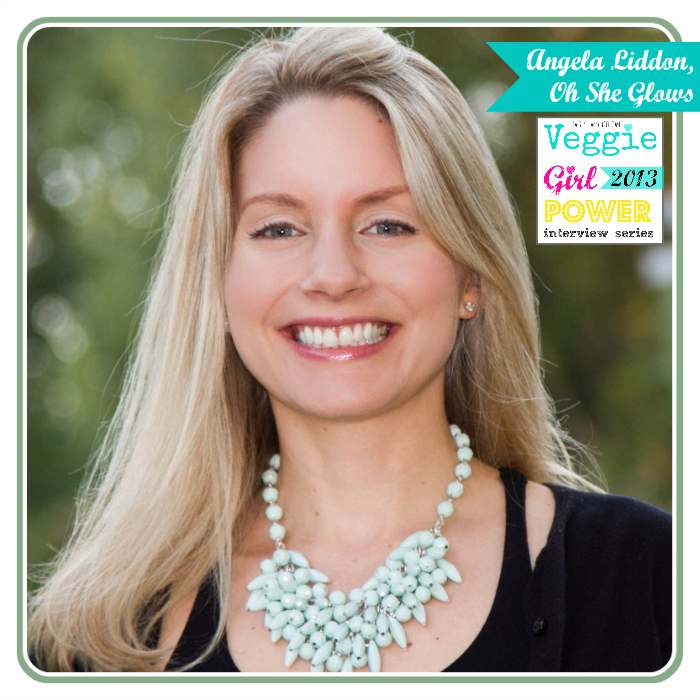 Oh She Glows, Angela Liddon: Veggie Girl Power Interview! The second amazing lady I am featuring in this year's Veggie Girl Power Interview Series is Angela Liddon of the blog Oh She Glows. If you a fan of vegan recipe blogs I'm guessing you already know of Angela and her inspiring recipes, so get to know this talented lady a little more in my VGP interview!.. Oh She Glows. When I first stumbled upon Angela's blog a few years ago the first thought that popped in my head was, wow what a cool blog name! I LOVED it! Seriously, it is still one of my favorite vegan blog titles out there because I think it describes so well what any vegan blogger, especially Angela, is trying to communicate to the world: life, amazing food and hopefully, improved wellness as well. The title "Oh She Glows..." to me, conjures up a feeling of being on a journey - movement, evolution and growth is really the base of any good lifestyle blog. Life is a journey (and adventurous one!) and Angela's recipes and inspirations are all products of her unique path. I think we can all relate to that! Angela's Blog won the 2012 VegNews Magazine Veggie Award for Favorite Blog this past year. Her beautiful photos and inspired recipes are pretty and delicious enough to inspire veg-curiosity in just about anyone who checks out her site. And congrats to Angela because she is working on a cookbook, and I'm sure it will be amazing! Angela is an inspiring blogger who I hope to someday meet in person because I pretty much know I will run up and hug her the first time I see her and feel like we have been friends forever. And as a blogger, I can tell you that we love to hear that we inspire that type of feeling in people who read our blogs. Angela comes through as a warm and friendly lady and her recipe creations are always beautiful and creative. Angela: My transition to a vegan diet was gradual and it happened slowly over the course of a year or so. I was struggling with IBS and my doctor suggested I try eliminating dairy to see if that made a difference. Well it did help a lot and that’s when I started to embrace the healing power of plants! Around the same time, I learned more about the meat and dairy industry. As a life-long animal lover, I realized that I didn’t want to contribute to the suffering any longer. All of us – animals included – deserve to be treated with respect, love, and dignity. I felt great eating a plant-based diet so the decision seemed like a logical one for me. I haven’t looked back since. Angela: I think most of us fear the potential of social rejection when going vegan and while that can definitely be an issue, you really just have to live the life YOU want. You aren’t going vegan for other people after all. If it’s what you believe and feel in your heart, find a way to make it happen. Other people will always have an opinion about what you do with your life one way or another so if it makes you happy, go for it! Angela: I’m about 30 minutes outside of Toronto and it’s honestly one of the best cities for vegan options, with new restaurants opening all the time. I can’t keep up with all the new vegan hot spots that I want to try out! I’ve been visiting Fresh restaurant for years now and it will always hold a special place in my heart. I love their Soho Falafel plate or quinoa onion rings to start. Oh, and I always order a green juice. Then, I usually order some type of bowl for my main such as the Energy Bowl made up of marinated tofu, coconut curry sauce, chick pea & vegetable stew, cucumber, tomato, red onion, sunflower sprouts & tahini sauce. Pure comfort food on a rainy day. Ok, now I’m getting hungry!! For a full listing of veg-friendly restaurants in Toronto, see here. Angela: I usually start my day with a Green Monster or Raw Buckwheat Breakfast Porridge. Other times, I go the savory route and enjoy leftovers for breakfast. Since I’m currently knee-deep in recipe testing for my cookbook, I usually end up eating whatever I’m testing that day for lunch. It’s been challenging trying to eat a balanced diet with all the recipe testing going down, but I just try to do my best each day and not worry about it too much. It probably goes without saying, but I ALWAYS have hummus in my fridge, either homemade or store-bought. When I run out of hummus, I start to get shaky and headache-y. Ok, that last part was a joke, but I really do love my hummus! My husband always jokes if there was a fire I’d grab my cat, Vitamix, and hummus! Angela: Veganism is the best way I’ve been able to connect with the world around me. Books – Undiet by Meghan Telpner; Eat Raw, Eat Well by Doug McNish; Vegan Secret Supper by Merida Anderson; and Let Them Eat Vegan by Dreena Burton….among many others! Blogs – I’m subscribed to over 200 blogs in my reader, so there are too many amazing blogs to mention. Some of my favs are Choosing Raw, VK Rees, PPK, Plant Powered Kitchen, Edible Perspective, Keepin It Kind, This Rawsome Vegan Life, Vegan Culinary Crusade, and of course, Healthy Happy Life! Videos – They aren’t really new, but I always get a chuckle out of those $hit Vegans Say videos on You Tube! Angela: Can I select all of the above? Ok, since I have to narrow it down to one thing how about we talk about how vegan food is often rejected by those in the professional culinary industry. It is such a pet peeve of mine. On the positive side, it only makes me more motivated and passionate about sharing how delicious vegan food is. I’ve often felt so discouraged when other culinary professionals (be it chefs, cooking channels, or food magazines) give the impression that a vegan dish is somehow lacking or not worthy of haute cuisine. This is so not the case! Now, of course there are exceptions and it’s not like that everywhere. Thank goodness for vegan chefs like Tal Ronnen, talented food bloggers, and cookbook authors who show that you don’t need an animal to create a delectable, fancy meal worthy of any foodie’s attention. Angela: The project that is taking up most of my time right now is my first cookbook which is due out next year! 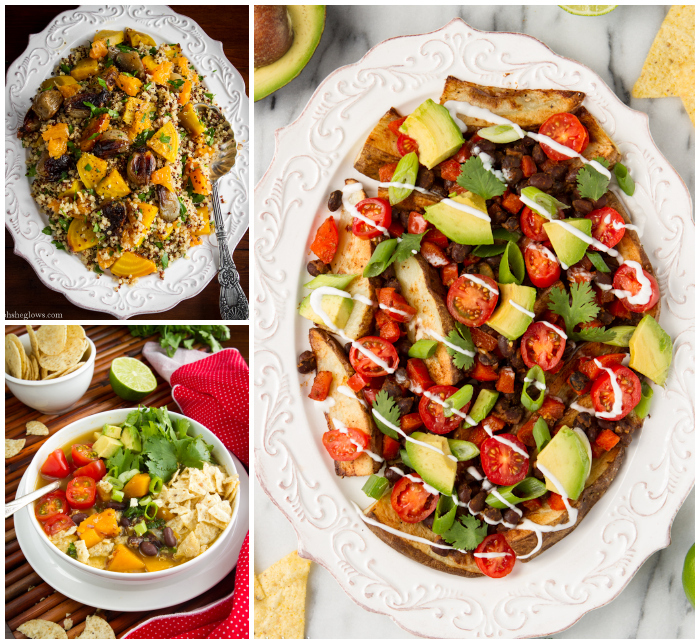 My cookbook will feature over 100 vegan recipes with tons of gluten-free and soy-free options. I’m shooting all of the photography (100 photos) and doing the food styling in addition to recipe creation and writing, so it’s been a huge, scary, crazy undertaking. I can’t wait to hold the book in my hands and finally share it with the world! My husband and I are also working on an app for Oh She Glows which will feature my blog recipes as well as new and exclusive recipes just for app users. He’s doing all of the back end programming (bless his soul) and I’m helping with design and formatting. I’m not sure when it will be ready for launch, but I’m hoping sometime this year. Angela: I love my Pink Flamingo Smoothie which was based off a smoothie by Fresh restaurant. It’s the perfect warm weather drink and only 3 ingredients! Angela: I definitely think a plant-based diet is the way of the future and will only continue to grow in popularity. Thankfully, a vegan diet is supported by the UN and WHO, among others. Change desperately needs to happen for the animals, environment, and our health. A big thank you to Kathy for including me in this amazing series! I look forward to reading more.